East and west Ipswich are places apart: the docks cut right into the centre of the town from the south, and to the north spreads the great expanse of Christchurch Park. I know indigenous east Ipswichers who never go into the western half of the town, and vice versa. Both sides have their own character; I prefer the eastern side, and have lived there for nearly 25 years now. 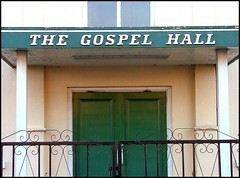 One of the characteristics of east Ipswich is its Brethren population, and here among the pleasant terraced streets sits this little Gospel Hall, with its cream walls and 'Rizla-style' lettering along the front. For six years we lived in a house in the next street, and so I know this little chapel well - or, at least, its exterior, because I have never been inside. It dates from the 1930s, I should think, but may have had an earlier use. It would be interesting to know. It seems to be a fairly busy place, with lots of activities. Ipswich has, apparently, a higher proportion of Brethren and Gospel fundamentalist congregations than any other English town apart from Plymouth and Norwich. 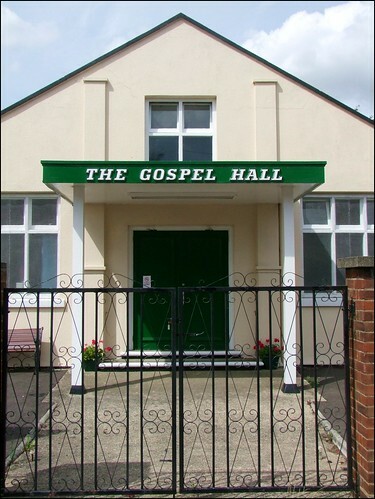 When I moved to Ipswich, there were three little Brethren chapels on the east side of town, including this one, as well as a large, modern warehouse building used by the stricter Brethren. The Brethren identify themselves by their separation from other congregations. The fact that, today, just one of those three small chapels survives in use, while the large modern Strict Brethren chapel has been joined by a second even larger and more modern building, may reveal something of how the currents in this necessarily fragmented denomination are running.